Before I start writing again about travel, I have a couple more of these nostalgic posts to get through. Don’t blame me, blame the year. As it turns out, 2018 is filled with anniversaries. Czechoslovakia turns 100 years old later this year. Later this month, Czechs and Slovaks will mark the 50th anniversary of the Warsaw Pact invasion. The Globe Bookstore & Coffeehouse turned 25 in July. I have high school and college reunions as well, and there’s even an anniversary I’d completely forgotten about. At least, that is, until I met my old friend, Katrin, for lunch a month or so ago. 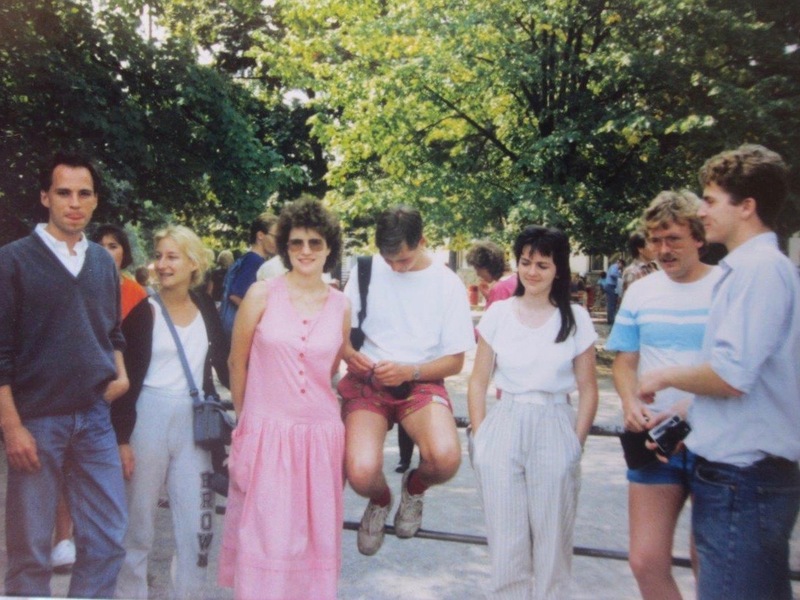 This week, the blog travels back in time to the summer of 1988 in the Moravian capital, Brno, where Katrin and I were both students on a strange month-long summer-school program that was meant to teach us Czech, but ended up teaching me (at least) more about Czech folks songs and other useful insights. Top Photo: A view from 1988 of Leninova street, the address of our student dorm and along the walk we took each morning to attend class. Back then, the street was stark, relatively empty, and filled with army and police buildings. The gray high-rise at the back is our dorm. Photo credit: Katrin B. Posted in Diversions, Tales From The Past and tagged 1988, Brno, Czech, Czech language, Moravia, summer school. Our Brno summer-school class of 1988. Katrin is easy to recognize here; she's at the center, staring off somewhere to her right. Unfortunately, I'm not in the photo. I had to leave school early that day to return to Vienna. Photo credit: Katrin B. This was part of the small group of English speakers who were on the program. I'm at the far left with my linguistic comrades from the UK. Photo credit: Katrin B. 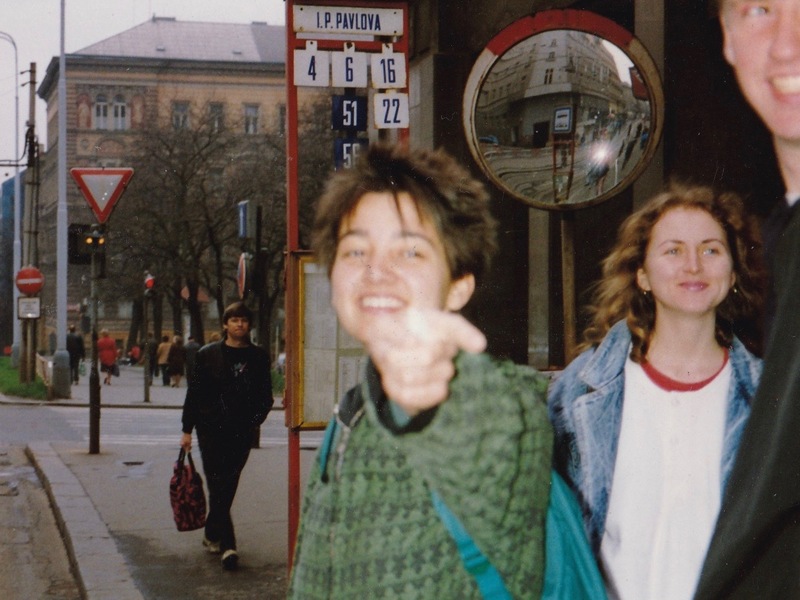 My friend Katrin, pictured here in Prague sometime in 1989. Photo by Mark Baker. Although Katrin and I both live in Prague and have for a long time, we don’t get the chance to meet very often. She’s busy with work and family stuff, and I travel too much. Earlier this summer, she sent me an invitation to an open house at the German embassy in Prague where she works. I was drowning in deadlines and couldn’t make it, but suggested we meet up for lunch the following week. She chose a fancy Italian place, Pastař, for us to meet, but I didn’t mind. I’d been thinking for a while the restaurant might make a nice addition for a guidebook listing but hadn’t had the opportunity to try it. Besides, it’s across the street from my office. It turns out she was right. 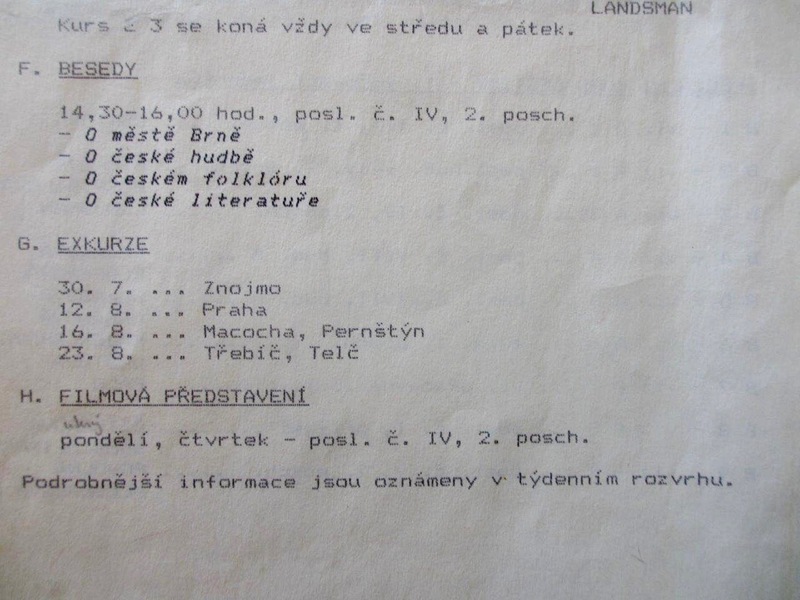 It was nearly 30 years ago to the day that Katrin and I were both Czech-language students at Brno’s summer school for foreigners: "Letní škola v Brně." She was one of several West German students attending the program (plus a bunch of East Germans) that year, while I was the only American (if memory serves). 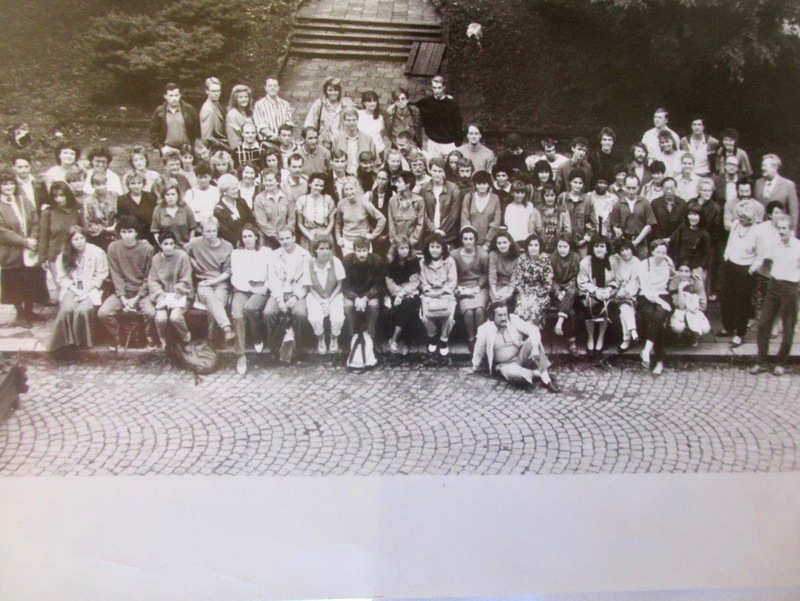 Judging from the group photo (reprinted here), there were around 80 of us in all that year. The idea was to spend a month focused on perfecting our (in my case, rudimentary) Czech-language skills. 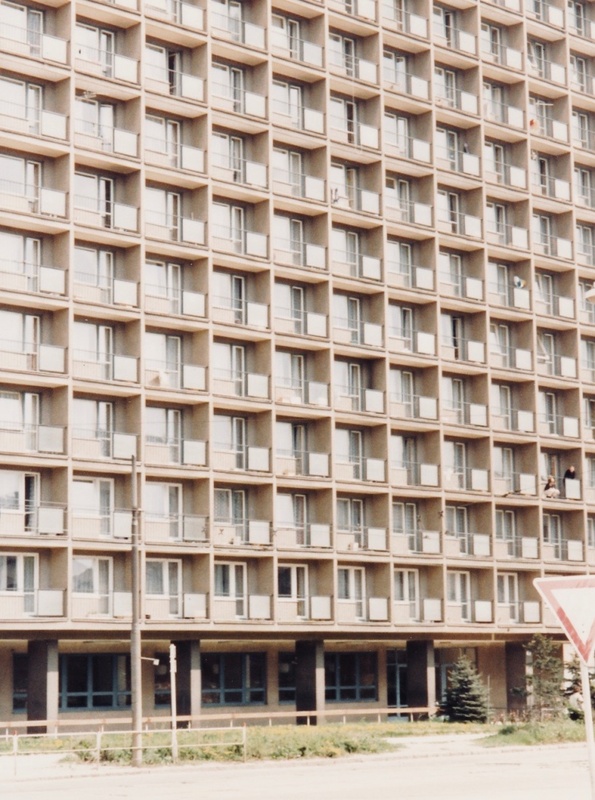 We all lived together in a university dormitory, called the “Družba” ("Friendship" in Russian), conveniently located on a stern, featureless street called "Leninova" (after Lenin). Classes were held in some of Brno’s university buildings nearby. That conversation got me thinking about that month in Brno. 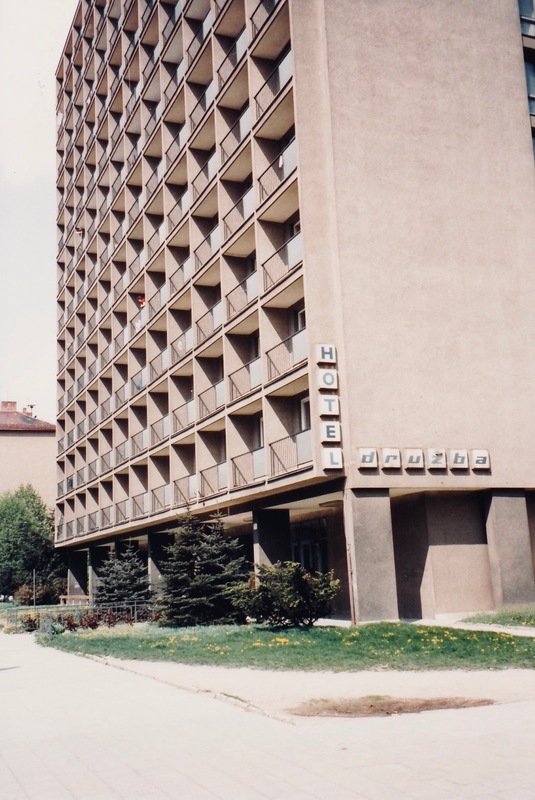 It was the longest continuous period, until that point, I’d ever stayed anywhere in the former Soviet bloc. I was excited to go, but equally excited to leave when it was over. The experience affected my impressions of Eastern Europe back then and still shapes my thoughts about this part of the world now. This post is about me trying to work out how. Here's a scan of our program, showing some of our lectures, excursions and film presentations. I remember singing Czech folk songs, seeing a couple of movies and attending a classical music concert or two. Photo credit: Katrin B. 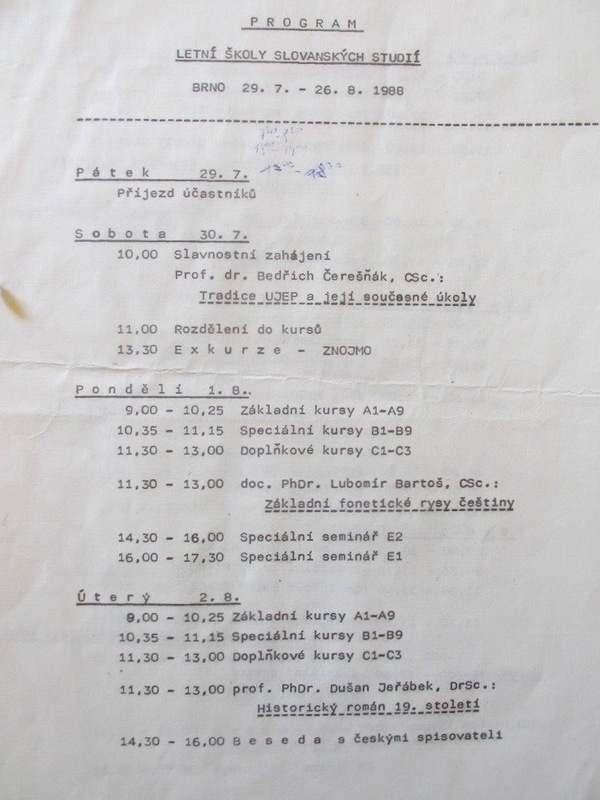 A scan of our program for the first week of school, including a field trip to Znojmo that got lost in a lot of beer and wine. Photo credit: Katrin B. By coincidence, I’d been planning to travel through Moravia a few weeks later to attend a conference of TBEX travel bloggers in the city of Ostrava. The drive over from Prague would take me through Brno. I figured why not pair the trip with a stopover in the Moravian capital? 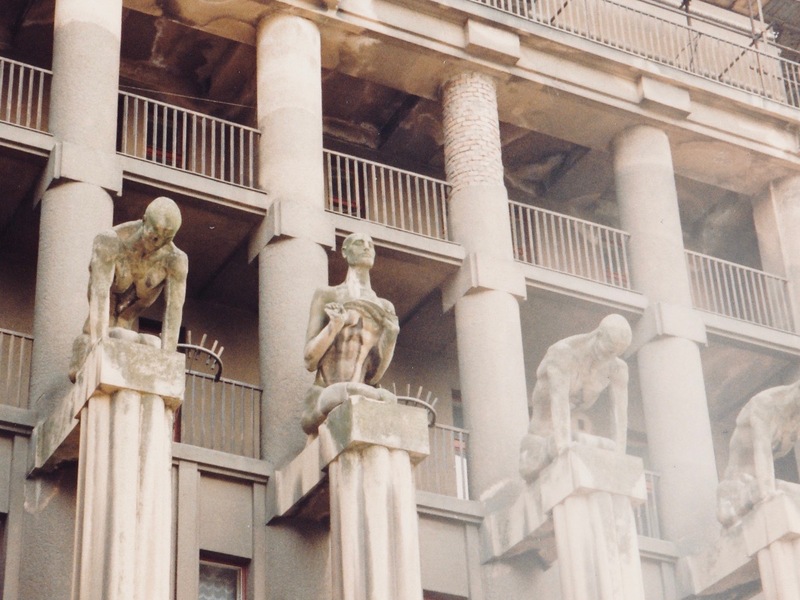 I could carry out some guidebook research for Lonely Planet and also spend time wandering around the city and reconnecting with my pre-Velvet Revolution self. Katrin was kind enough to email me with some of her old photos from those days, along with some scans of the summer-school program. I’ve included them here in this post. Thank you! 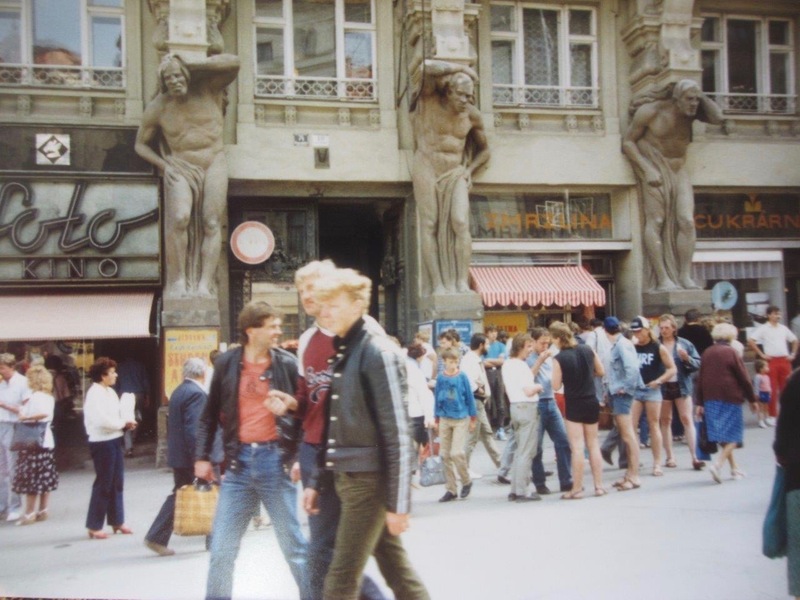 If you’ve read my earlier posts about the 1980s, you’ll know that by the summer of 1988 I was working as a journalist at the Vienna branch of a small publishing outfit called Business International. Earlier that year, I’d been assigned to cover Czechoslovakia, but my Czech was only good enough to scan the country’s statistical yearbook and catch a headline or two from the official communist newspaper: Rudé právo. I’m not sure whose idea it was to send me to summer school in Brno, but I was happy to go and very much looking forward to learning about the language and country. We were just a little more than a year away from the 1989 Velvet Revolution at that point, but it was clear from my company’s decision to send me that no one there expected any major political changes any time soon. Once I got to Brno, it was clear no one on the other side of the line was anticipating a revolution either. As strange as it may seem now, the division between East and West was accepted without question by both sides and perceived as being as normal and natural as the phases of the moon. I was a couple of years older than the other participants, who were still mostly college students, and I wasn’t sure what to expect. 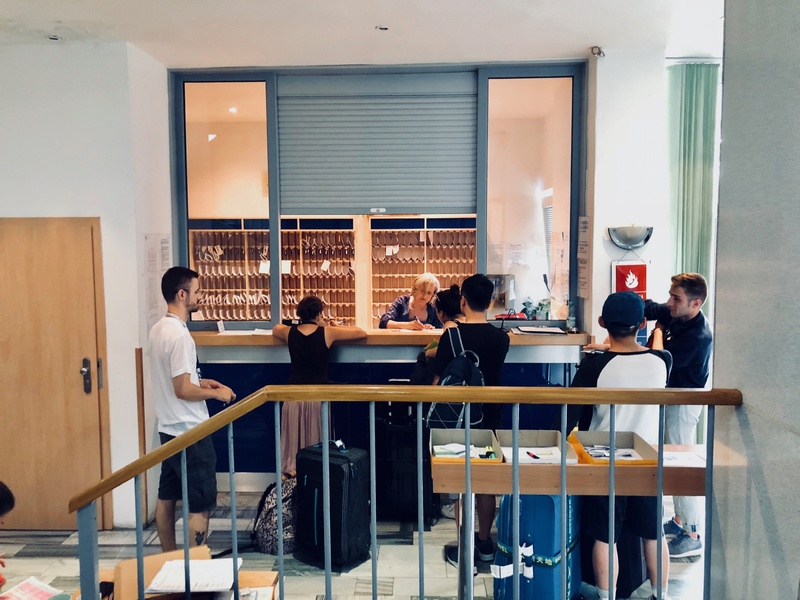 I got a taste of what was in store, though, right from the beginning: at the Czechoslovak border, after catching the bus in Vienna on a July morning for the trip up to Brno to start the program. Border crossings were a lot more complicated back then. These days, borders are wide open and buses sail right through. In 1988, however, we'd of course be crossing the Iron Curtain, and all cars and buses would have to stop for a thorough inspection. The whole thing could take an hour or longer. And so it was on that particular morning, the bus rumbled to a stop and we prepared to get off to show our passports and answer questions from stern-looking officials about why were coming and what we were planning to do. Before lining up for the customs inspection, I wandered over to the bathroom. As I walked in, I was surprised to see a guy standing there and sweating profusely. He was a bit younger than me, obviously foreign, and pretty worked up about something. “Do you think they’re going to search us?” he asked me (in English, with a British accent). “I don’t think so," I said, "but I’m not sure." And then I asked him why. At that point he showed me a small amount of grass (or maybe it was hash) that he’d rolled up in some plastic wrap or aluminum foil, thinking he was going to take it with him across the border. He was suddenly, urgently looking for a way to get rid of it. 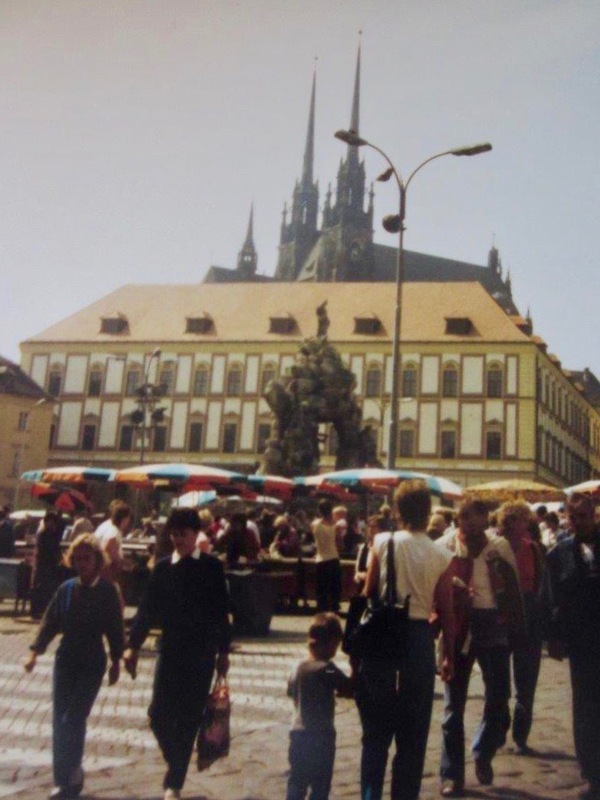 View of the Cabbage Market in central Brno in August 1988. Photo by Katrin B. 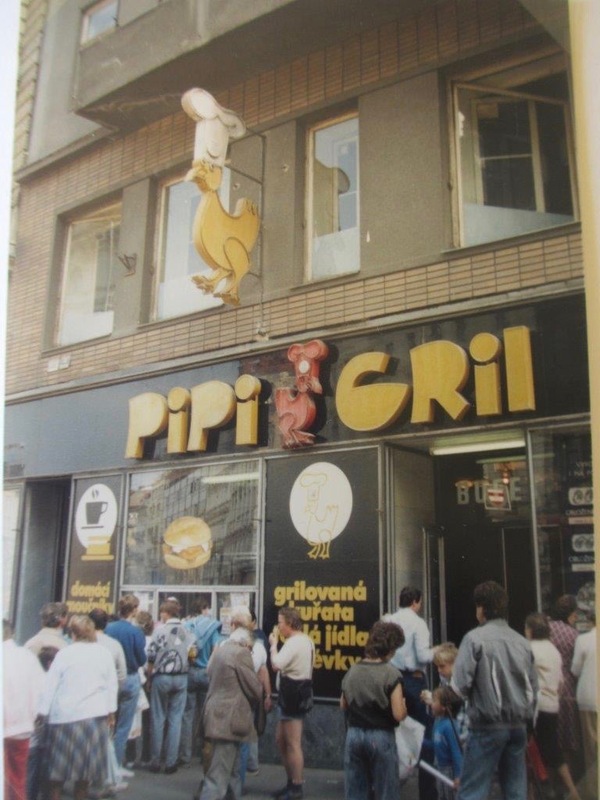 This grilled chicken window on Brno's central Náměstí Svobody was one of the better food options in 1988. Sadly, it's long gone. Photo credit: Katrin B. 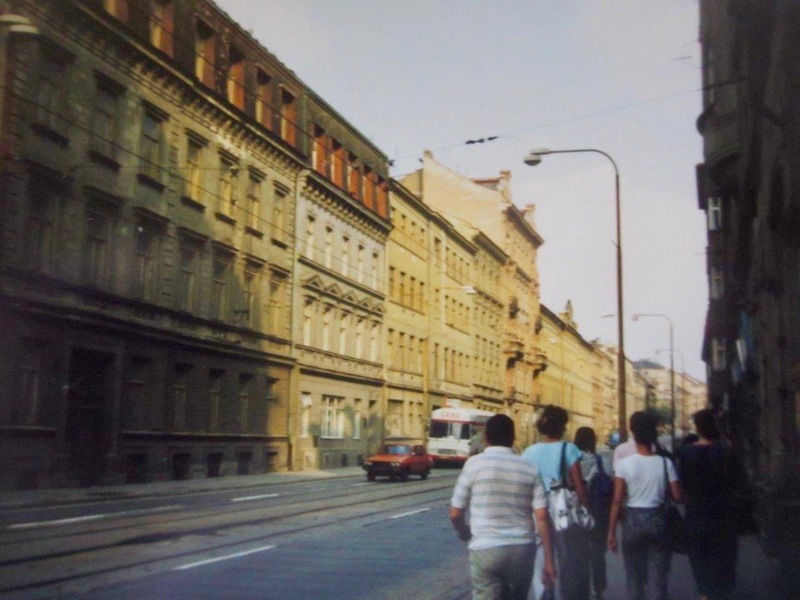 Probably walking to or from class along a busy street in Brno in August 1988. Photo by Katrin B. 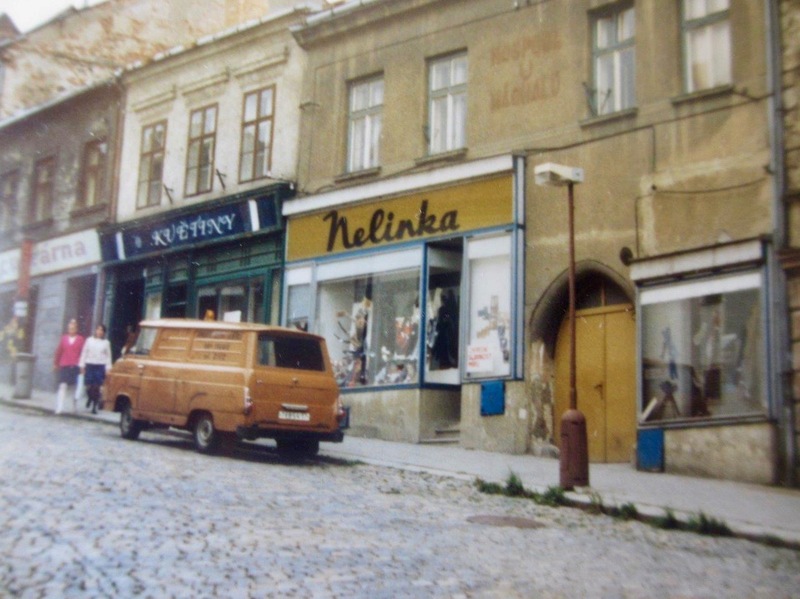 Street scene from central Brno in August 1988. Photo by Katrin B.
I have an on-again, off-again love affair with the Czech language. After so many years and so many lessons, to my eternal shame, I’m proficient but not entirely fluent. It’s not that I’m terrible with languages (I managed to pick up German fairly quickly in Vienna, and French as a student in Luxembourg), but for some reason I have a bit of a block with Czech. What I am fluent in, though, is Czech folk music (or, more precisely, Moravian folk music), and for that I owe my gratitude to that summer school in Brno. While our mornings at the school were taken up with hours of rigid instruction in Czech grammar, in the afternoons, we mostly learned and sang folk songs. I can’t tell you how many times over the years this peculiar knowledge of Moravian folk music has saved me, particularly out with friends or on a date in a traditional pub or restaurant. Whether we were in Bohemia, Moravia or Slovakia, the scene would always be the same: we'd order our food and drink, and suddenly in would waft the first strains of violin music from the “gypsy” band performing the night. Not long after that, the guys would be standing at our table, hat in hand, asking for a song request -- and expecting a tip. Thanks to summer school, what could have been a series of fraught encounters over the years, instead, became child’s play. I always had (and still have) a ready-made list of request tunes in my head, and can even sing along if necessary. 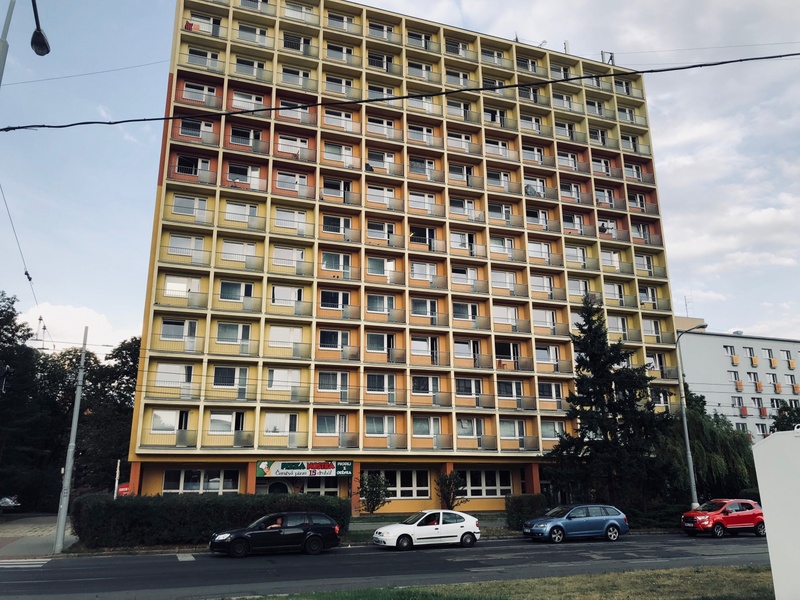 Our old dorm, the Družba (now renamed Kounicova), as it appeared in July 2018. It obviously got a fresh coat of paint a few years ago, but it's slowly regressing to its old, institutional self. Photo by Mark Baker. Another photo showing the old dorm as it appears today. Photo by Mark Baker. 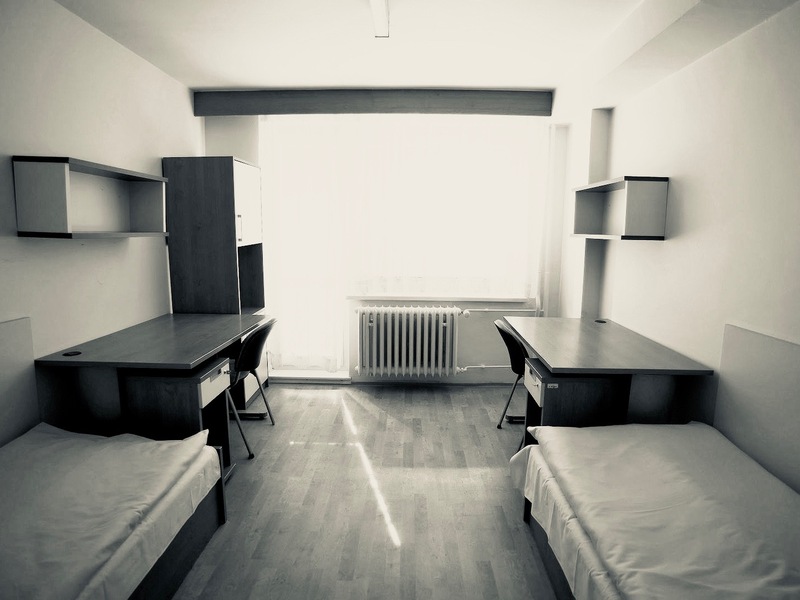 The interior of one of the rooms of the dorm. This photo is from a modern website and shows how the rooms look now, but it's not all that different from 1988. 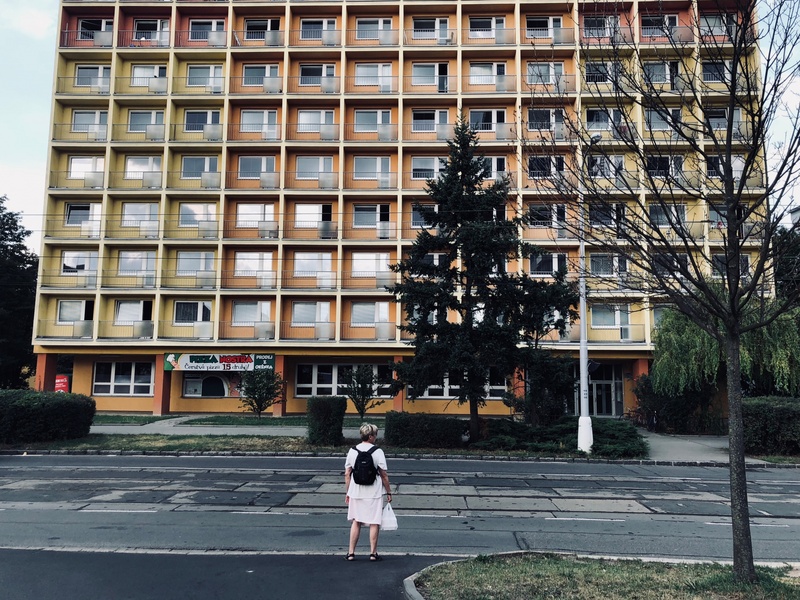 During my recent stopover in Brno, I rode my bike out to the old dormitory, which was just a few hundred meters north of the Hotel Continental, where I was staying. The dorm is still standing (and incredibly still housing students for the summer-language program; the 2018 edition coincidentally started the week of my visit). It's no longer called the "Družba," which in retrospect sounds way too communist, and the street has been renamed "Kounicova," after a Czech count from the 19th century. As for Lenin, there were no signs of him anywhere. The first thing I noticed was that the outside had gotten a fresh (and garish) coat of paint sometime in the past decade. No matter how cheerful, though, the newish red, yellow and orange façade appeared, the pervasive institutional drabness (that I remembered so fondly) remained intact. You could sense it immediately in the overgrown trees and burnt-out patches of grass in the front of the building. I took a peek inside and got a whiff of the communist-era linoleum cleaner they must still be using, which prompted another rush of memories. Over the years, whenever I would think back on that old dorm, my mind would drift hazily (like recalling a dream) back to a small beer garden located somewhere behind the building. In my mind, there were a few plain tables and a string of outdoor lights, similar to what you might find at a campground. I don't recall spending much time there, but I was curious whether the place really existed or merely something my mind had invented. 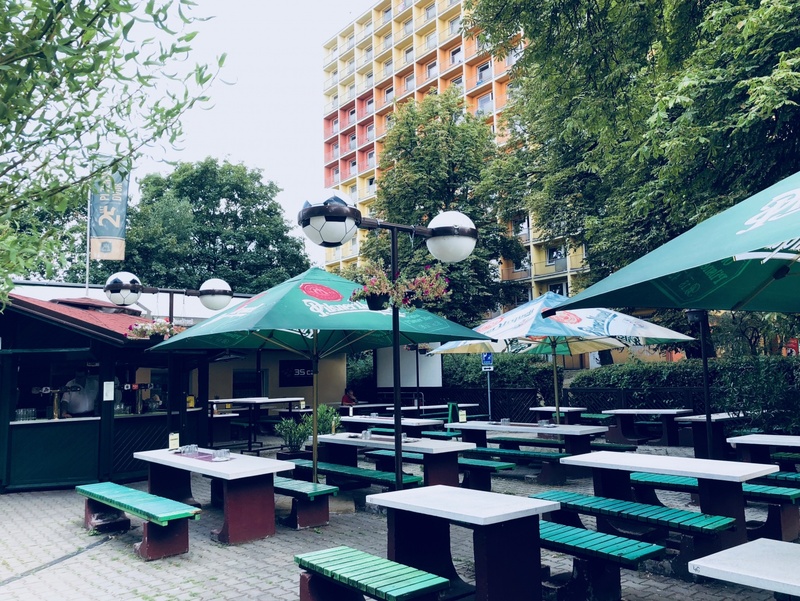 I took a walk around the back end and was relieved to find the “Plzeňský Dvůr” -- exactly the kind of make-shift beer-drinking joint I’d hoped to see. The tables, built on steady concrete, had obviously been around for more than 30 years. Afterward, I cycled around the city, which sparked off more long-buried impressions and memories: of drinking at tacky outdoor terraces up near Špilberk Castle, hanging out at a popular milk-bar called Sputnik (which later, sadly, became a KFC), and grabbing what locals back then euphemistically referred to as “pizza” on the terrace of the Continental Hotel (the very hotel I was staying in on the trip). Slowly, though, a different kind of recollection began to shape in my mind -- this was not a specific memory of anything in Brno, but rather more of something in me. We'd obviously had fun in our classes and nights out in the pub, but my main takeaway from Brno that summer hadn't really been excitement. It was more a feeling of emptiness. 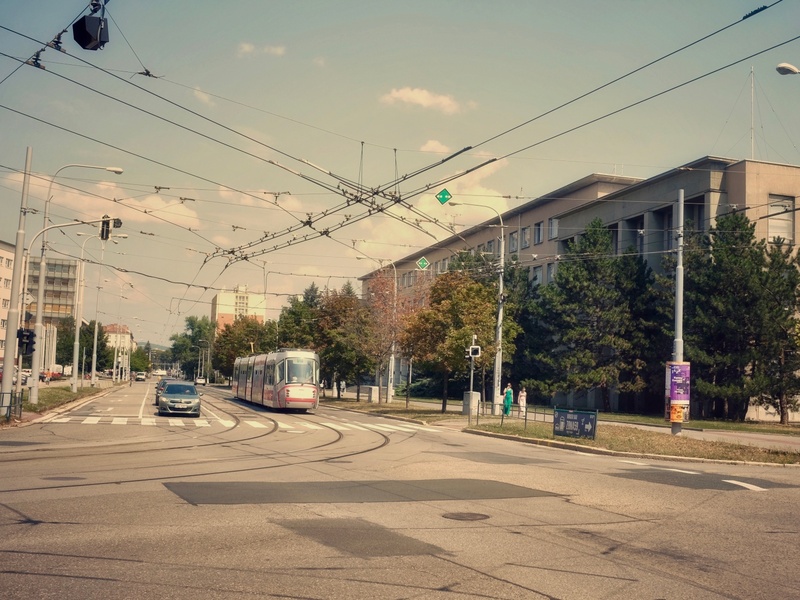 We had a surprising amount of free time at school (or at least I did), and I remembered taking long walks on my own around some of Brno's older, poorer neighborhoods to the south and east of the center. From a ridge, I'd look out onto the dusty, empty streets in the distance and try to pick up a vibe -- any vibe -- or feeling of familiarity. All I'd get was stillness. This isn't a knock on Brno (which is a great place to spend time), and obviously there was more going on back then than I was aware of. My antennae simply weren't tuned to the right frequency, and I lacked the experience needed to inform my perceptions. What I realize now, though, is that I was experiencing something a little different. 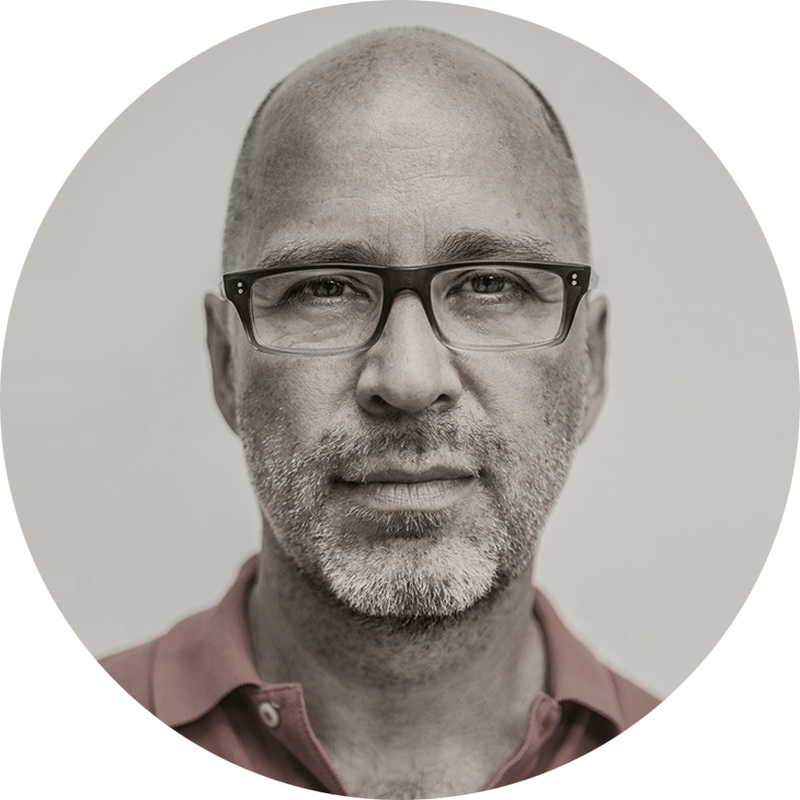 It wasn't simply emptiness or alienation but more akin to hyper-awareness -- a sensation I think we all occasionally have when we're outside our own familiar cultures. I'd describe it as something like an exaggerated sense of apartness or otherness that allows us -- momentarily at least -- to feel our own existence much more intensely. Expats and long-term travelers will know exactly what I mean. I felt it strongly that summer of 1988 -- maybe for the first time -- and reflecting on those old days in Brno, it came rushing back again. I wrote about Brno's heritage of modern architecture in an earlier post. Find it here. 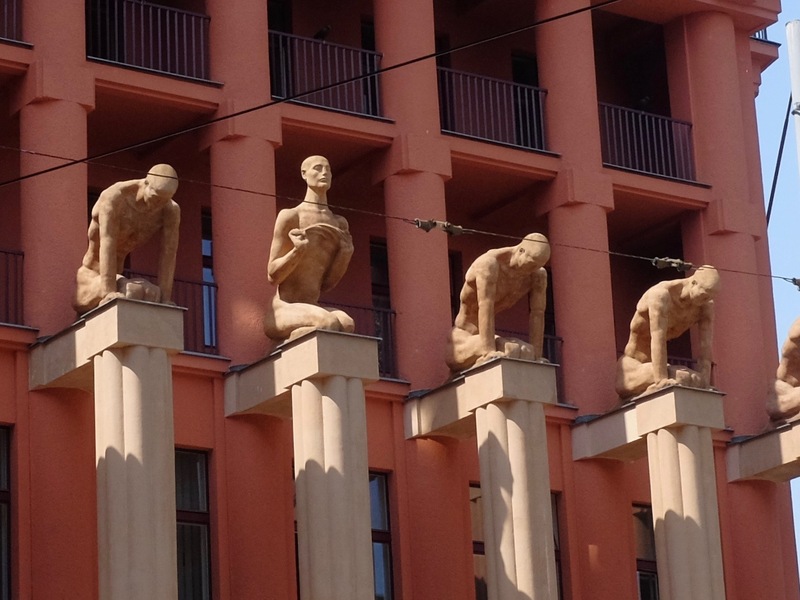 The most fascinating building facade in Brno is the front of a polyclinic that was just around the corner from our dorm and along our morning walk to class. Photo by Mark Baker. The facade of the polyclinic as it looks now. Still striking in spite of recent makeover. Photo by Mark Baker. The little pub behind our dorm has evolved over the years. It's now called the Plzeňský Dvůr -- I'm not sure what the name was back in 1988. Photo by Mark Baker. Former Leninova street as it appears now. Compare this with the image from 1988 at the top of the post. It's still a bit lifeless but the trees have grown a lot taller. Photo by Mark Baker. World War II ruins were still visible along Leninova in August 1988. 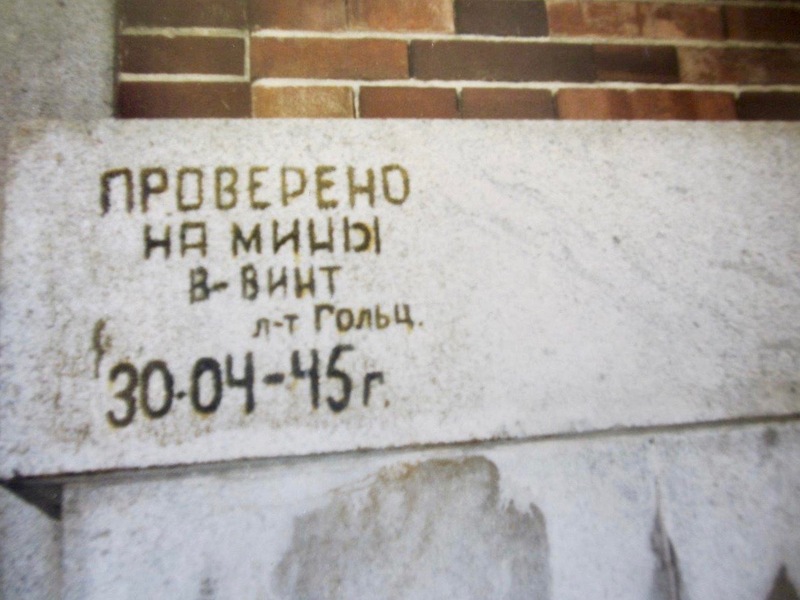 The sign in Russian indicates the building was cleared for mines on April 30, 1945. The soldier appears to have a Jewish surname. Photo by Katrin B. An atmospheric photo of the Moravian town of Třebíč from one of our field trips. Photo credit: Katrin B. This was such an interesting read, Mark, especially as I find myself doing a language course in Berlin at the moment. I never knew exactly what Družba meant, but in ?eské Bud?jovice it’s the name of a shopping complex barely hanging in there, but still on one of the city’s main drags. And yes, I know all too well that hyper existance feeling… I believe I even felt this way today. I seem to also have a similar block with Czech that doesn’t exist for me with other languages. The thought of someday passing a B1 exam seems like a pipe dream!